Ganga is only 4 but already has her first ‘car’, all thanks to her attendance at an INF Cerebral Palsy [CP] camp. Ganga was referred from INF’s Surkhet clinic for the camp held in April 2015. The first born of twins, Ganga has athetoid CP affecting all her limbs and speech, while her twin sister is free of disability. Ganga has limited head control, cannot roll, walk or sit unaided and though determined to try she is unable to use her hands for any functional tasks. Her physical disability does not hinder her from understanding the world around her and she uses her face and eyes to communicate with others, cheering a room with her beautiful smile. Ganga’s therapy is focused on good positioning and exercises that promote muscle development, communication strategies and ways of play that she can easily manage at home. 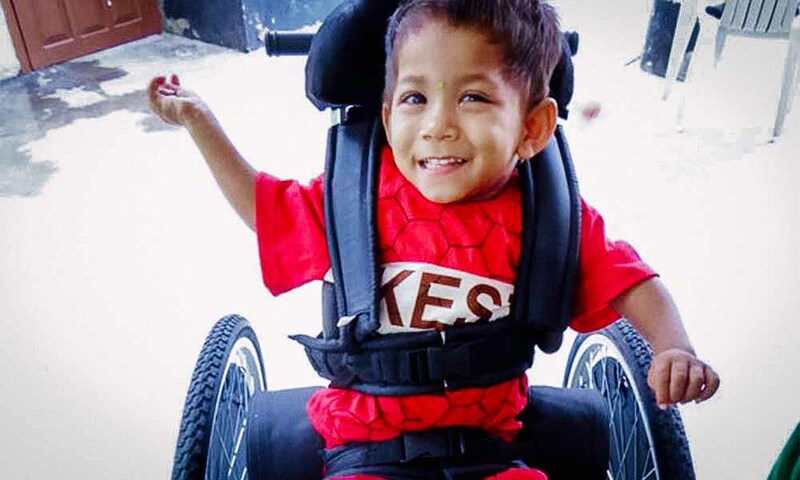 Ganga was very excited to get her own ‘car’ when she received her first wheelchair, not only does the chair give her mobility it is also designed to encourage a supported sitting position that will help prevent her from developing postural problems. Her sister was reportedly praying that Ganga would come home walking…we hope that the wheelchair is seen as an answer to her prayers! This most recent camp will not only be remembered as the time that Ganga got her first set of wheels but also as the time that Nepal suffered from the 7.8 magnitude earthquake which hit in the middle of the camp’s day off. Thankfully no one was injured, however as many of those attending were a long distance from home they were concerned for loved ones. Amazingly, phone lines remained open allowing contact with family far way so all could be assured. Those who had travelled for treatment were given the option of returning home but as most of them came from areas that sustained minimal damage, and travelling was not advised, all chose to stay and complete the training. While at times the attention of both staff and parents went to news reports and other things, it was a wonderful opportunity for INF to provide a safe and supportive environment and emphasise the importance of children and families even in the midst of disaster. Most of those attending the camp developed a good understanding of what was taught and showed enthusiasm toward continuing the program at home. INF works with those affected by Cerebral Palsy across a number of its programmes in remote and rural areas of Nepal. It also runs CP camps twice a year to serve the needs of children like Ganga. Camps are run at a rented training centre, enabling the attending children and their parents or grandparents to “live in” for the ten days of camp. While at camp children receive individualised therapy, are assessed for, and provided with, supportive devices [such as wheel chairs] and are taught exercises to continue with on their return home. Camps include Physiotherapy, Occupational Therapy and Speech Therapy assessment and intervention as well as educational sessions designed to enable families to support their child’s development. Some of the families attending have had exposure to CP treatment prior to the camp, either from Green Pastures Hospital and Rehabilitation Centre, the Surkhet clinic, or field visits to their homes by INF staff but for many this is the first time they have received any support. INF seeks to improve the quality of life for those with CP through treatment and rehabilitation, and through this they have greater independence and are fully involved in family and community life. PRAY | GIVE | GO | SHARE – Please pray for the ongoing work of CP camps, that those who attend would receive the care they need and that INF staff and families who have attended training would be successful in advocating for children with CP in their communities.